Superheroes have recently seen a resurgence in popularity. These days, many young people are finding their role models in the pages of comic books and in action movies. 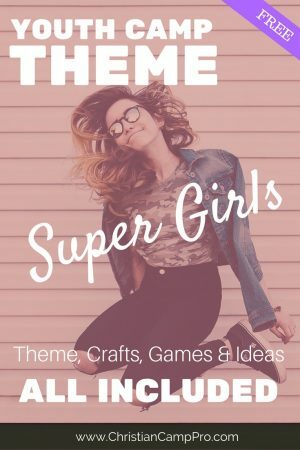 A Super Girls themed retreat aimed at young girls can help explore the idea of finding superhero strength and courage in God’s word. The pre-teens to teenagers involved can be equipped with scripture to help them navigate the difficult challenges they face as they grow into young women. Teenage life can be a minefield of tough decisions and awkward situations. However, young girls can be assured that they are never alone. This scripture passage clearly states that God is with us in every moment of our lives. We have no reason to ever be afraid. The battles young girls face can seem overwhelming, but they have an all-powerful God on their side who can strengthen them and give them courage. Superheroes are known for their good deeds. Likewise, followers of Christ should be known for their acts of kindness and selflessness. The scripture in Galatians urges Christians to keep doing well even when we see no immediate effect on the world around us. It’s often a daunting task to consistently do the right thing in a world that teaches “self above all else,” but young girls can be assured that their faithfulness and good works do not go unnoticed or unappreciated. 29 He gives strength to the weary and strengthens the powerless. 30 Youths may faint and grow weary, and young men stumble and fall, 31 but those who trust in the Lord will renew their strength; they will soar on wings like eagles; they will run and not grow weary; they will walk and not faint. Unlike most popular superheroes, young girls do not have superhuman strength or an unending supply of power and energy. Humans get physically tired and emotionally drained. God promises in His word, however, that He will restore and renew the strength of all who look to Him and trust Him. Despite the fragility of their human bodies and the limits of their energy and strength, young girls can continue to find renewal in God’s power. He is the ultimate Power supply! A simple superhero craft is a great way to get a retreat started. It opens up the conversation and encourages participants to get to know one another and work together. For this superhero craft, lay out an assortment of colorful foam masks and allow participants to decorate them to reflect their personality and/or character. The masks can be purchased in bulk at most craft stores or can be made using an online template and colorful construction paper. Supply lots of stickers, glitter, foam shapes and markers for the girls to use to decorate their masks. Depending on the age range of your participants and the space available, an obstacle course can be a fun activity for your retreat. Set up a variety of challenges either for individual participants or teams. You can award prizes for the individual/team who runs the course in the quickest time or give training badges to everyone who completes the course. The obstacle course can be set up outdoors or indoors if space allows. In this game, participants dance together to some lively tunes. When the music stops, each person must quickly strike a superhero pose. The last one to strike a pose is eliminated from the game. The last one standing is the winner. For this game, participants must keep a straight face while their opponents tell jokes or make funny faces. The person who can keep from laughing the longest wins. A photo booth is a fun way to create a lasting memory of your retreat. For the Super Girls theme, construct a simple cityscape backdrop with cardboard and colored paper. Print out some fun props for participants to pose with. You could even include this simple superhero frame to put the picture in. You can use any combination of funny, heroic, or even biblical names for this activity. This can be done at the beginning of the retreat and the names can serve as the participants’ identities for the duration of the retreat. It could also be used as filler for any unoccupied time slots. Now that your participants are armed with the scriptural tools they need to be a force for good in their daily lives and interactions, it’s important to give them a clear mission. Assemble your team of super girls and reemphasize their importance to society as young women of God. Give them examples of ways they can make an impact on the world around them. Challenge them to go out and show kindness, do good deeds, and be positive role models for their peers. A superhero themed retreat for girls can be a great way to positively empower upcoming young women. They can learn to trust in God for their strength, to look to Him for courage, and to do good deeds for His glory. While they may not have their own super-powers, they are cherished by an all-powerful Father who wants to see them soar! Special thanks to Grace Adventures for making this article possible.